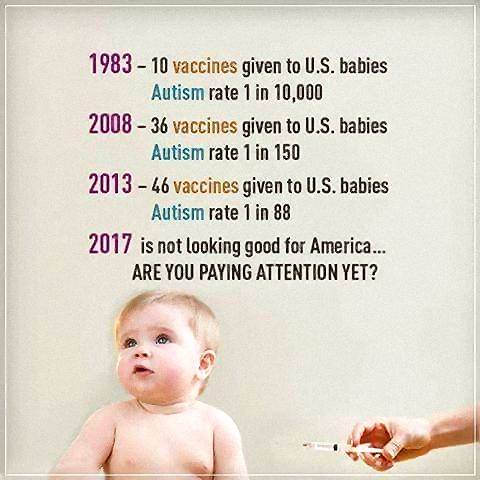 Earlier today, an addlebrained anti-vaxxer posted a link to this bogus article on a social media website: FDA Announced That Vaccines Are Causing Autism. 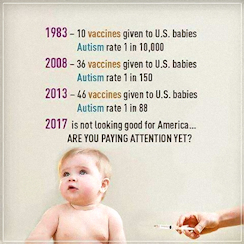 That article was, of course, immediately debunked by other people through a myriad of fact-check articles, such as Debunking False Vaccine Claim, Is Autism Now Disclosed as a DTaP Vaccine Side Effect?, etc. But even if that claim had been true for that single vaccine, that would still not apply to the hundreds of other vaccines for which there is incontrovertible proof that they do not cause autism. However, this hoax refuses to die because people who are unaware of the actual research keep reposting bogus images and articles like those shown above, and dangerous diseases which we had almost eradicated from the planet are making a comeback. In the USA, this is especially prevalent due to the lack of daily suffering that is seen in underdeveloped countries; this false sense of security was paradoxically caused by the success of our vaccination programs. (See Vaccine Safety Questions and Answers.) As a result, more children in the USA are growing up with a greater risk of contracting an unnecessary disease than they are of autism. One of the greatest controversies in autism spectrum disorder centers on whether a link exists between the disorder and childhood vaccines. Despite extensive research, no reliable study has shown a link between autism spectrum disorder and any vaccines. In fact, the original study that ignited the debate years ago has been retracted due to poor design and questionable research methods. Avoiding childhood vaccinations can place your child and others in danger of catching and spreading serious diseases, including whooping cough (pertussis), measles or mumps. In other words - if you are a parent, do not fall victim to the misguided anti-vaxxer paranoia that is infesting social media and other fake news outlets with disinformation; do the world a favor and vaccinate your children. Attempts to demonize our successful and scientifically-verified vaccination programs is ridiculously naïve, and future generations will look back on our present-day anti-vaxxer hysteria with the same level of contempt and disgust that we have for the Salem Witch Trials of the 1690s. 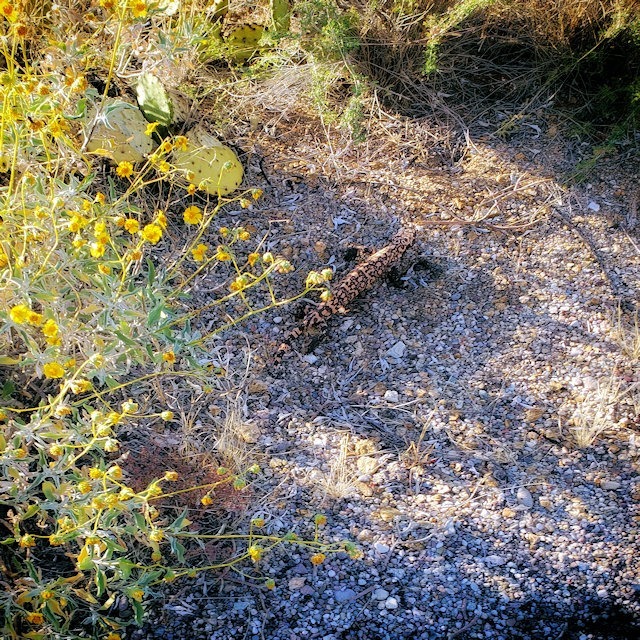 As I was riding my bicycle through the Arizona desert outside Tucson yesterday afternoon, I saw a good-sized Gila Monster, which was my first sighting for this year. As you can see, there are several items which I have yet to see or do for the year, but only four months have gone by; there's plenty of time to fill up the list. 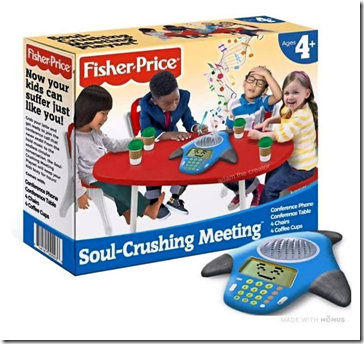 A friend of mine posted the following image to social media… and as someone who has had to attend more than a few soul-crushing phone conferences, I thought it was hilarious. That being said, I thought this play set was missing a few things that would add to its realism. For example, why doesn't it come with a whiteboard and four dried-out markers? 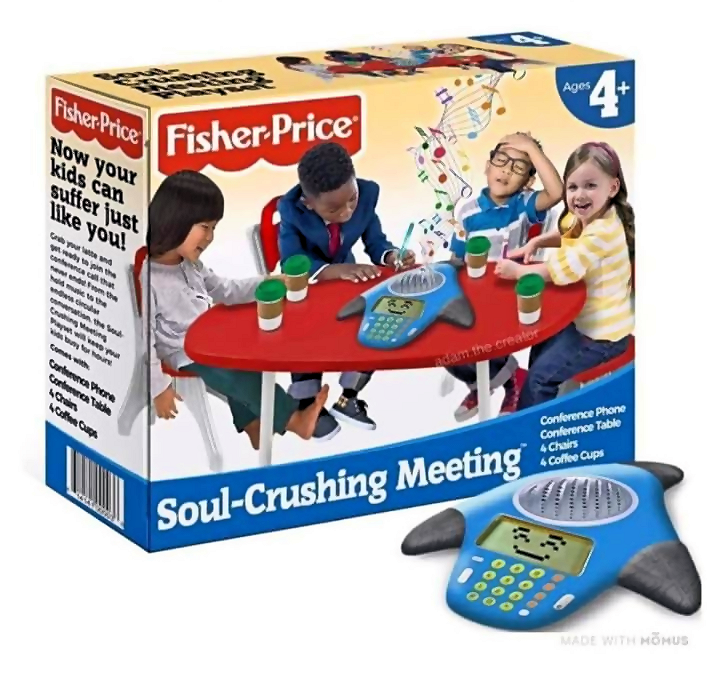 In addition, the conference phone should come with dozens of lifelike features, such as Dropped Calls, Random Static, Open Microphone Keyboard Typing, Private Background Conversations, and 15 minutes of 'Can You Hear Me?' dialog. 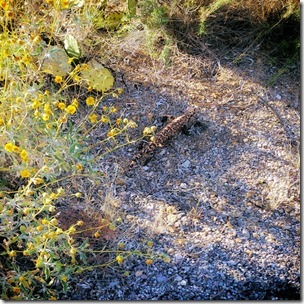 This would turn your kids' 5-minute meeting into hours of troubleshooting entertainment - every time!